Biological pollution is one of the major threats to global biodiversity. Marine invasive species are particularly difficult to control due to a lack of barriers to their spread. One of the most ecologically harmful marine invasions to date is the rapidly expanding population of non-native lionfish (Pterois spp.) in the western Atlantic. These fish have had marked ecological impacts throughout the Caribbean and in some areas lionfish increases have coincided with significant regional declines in native fish species biomass. Lionfish are highly fecund; they mature within a year and then spawn every four days year-round. They can produce two million buoyant eggs per year and these develop into pelagic larvae that disperse widely on currents. The adults have anti-predatory venomous defences and an ability to prey upon a wide range of fish and invertebrates, a combination that makes lionfish rapacious invaders. Evidence from the coasts of Cyprus indicates that Pterois miles has set off a new invasion, this time in the Mediterranean. Two decades after their first appearance in the Mediterranean, a specimen was caught off Lebanon in 2012 and in just four years, lionfish became established around Cyprus, Greece, Lebanon and Turkey. Clearly, current environmental conditions are now suitable for lionfish reproduction in the eastern Mediterranean. Continued warming of the Mediterranean basin increases the risk of a speedy invasion. To stand any chance of controlling this invasion the competent authorities and relevant stakeholders must work together to combat the problem at this early stage. Although it may already be impossible to eradicate the lionfish from the Mediterranean, it is feasible that its impact on priority habitats and biodiversity hotspots can be minimized. However, no concrete actions are yet in place to deal with the lionfish invasion. Yet there is hope. 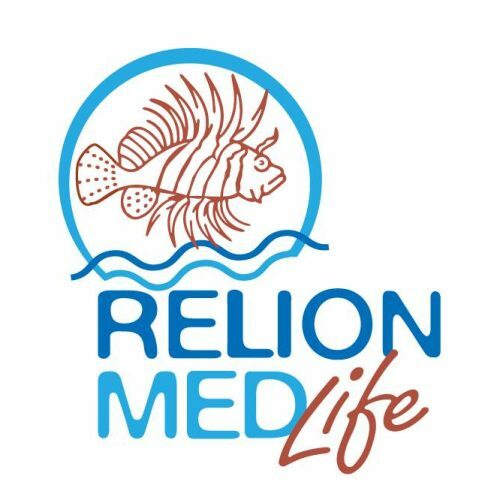 Α European, LIFE Nature and Biodiversity, four-year project, RELIONMED aiming to REmove LIONfish from the MEDiterranean, starts in September 2017. MER was the major driving force behind the proposal and we are proud to announce this project. During its implementation, MER will act as the scientific coordinator of the project. The project includes the University of Cyprus and the University of Plymouth, the private sector (MER), a local NGO (Enalia Physis) and the Department of Fisheries and Marine Research of Cyprus. RELIONMED project aims to demonstrate the effectiveness of existing practices to tackle marine Invasive Alien Species (IAS) by setting up a line of defence against the lionfish invasion through early detection, rapid response and effective management of marine coastal habitats off Cyprus. RELIONMED will encompass several activities strongly relying on citizen scientists’ and stakeholder’s participation and aiming to increase awareness, and motivation to assist. A robust and dedicated early warning system driven by citizen scientists and monitored by RELIONMED researchers will be set up in collaboration with MedMIS. This platform will allow the identification of lionfish ‘hotspots’ across the Mediterranean, where removals should concentrate, thus helping in managing this alien species across European waters. Motivated stakeholders led by RELIONMED researchers will be assembled, trained and equipped to join Removal Action Teams (RATs) that will demonstrate opportunistic and targeted lionfish removals from Marine Protected Areas / Natura 2000 sites and from areas where the lionfish aggregate and breed across Cyprus. The project will explore and demonstrate the market potential of lionfish products (food, jewellery, aquarium trade) to make future removal efforts sustainable. Furthermore, RELIONMED will produce a risk assessment, modelling tool, manuals and guidelines on how to combat the invasive lionfish for supporting managers and stimulating the uptake and transfer of lionfish management practices over regional areas. The project will provide insights and evaluate the cost-effectiveness of the actions by ecological and socio-economic monitoring throughout the project’s duration; will identify limitations and best practices; will create social capital by building awareness and engaging citizens and provide the framework for controlling lionfish in the rest of Europe; and will identify research and information needs and understand trade-offs of lionfish in the Mediterranean. Thus, the project is anticipated to have a wide outreach and add significant EU value since it will stimulate citizen participation/awareness from a wide region, and will provide tools that allow managers/stakeholders to understand lionfish/ecosystem interactions and take correct decisions in order to minimize lionfish impacts to ecosystem services, biodiversity, health, fisheries, tourism etc. Throughout the project, a large amount of biological material will be collected and MER will be open to collaboration opportunities in line with RELIONMED objectives and for the implementation of complementary activities.